It amazes me that the boat gets better and better. Is it strange to say? Each time I put a layer of plywood onto the hull the boat becomes stronger. Last week I had the first rough deck layer in. It was relatively straight, but there was a gap in places where the deck did not come up entirely flush with the side of the topside hull. This looked to be a tough thing to fix. I puzzled out ways to pour epoxy into the gap to close it up, but there was nothing underneath the gap to prevent the epoxy from just running into the boat. 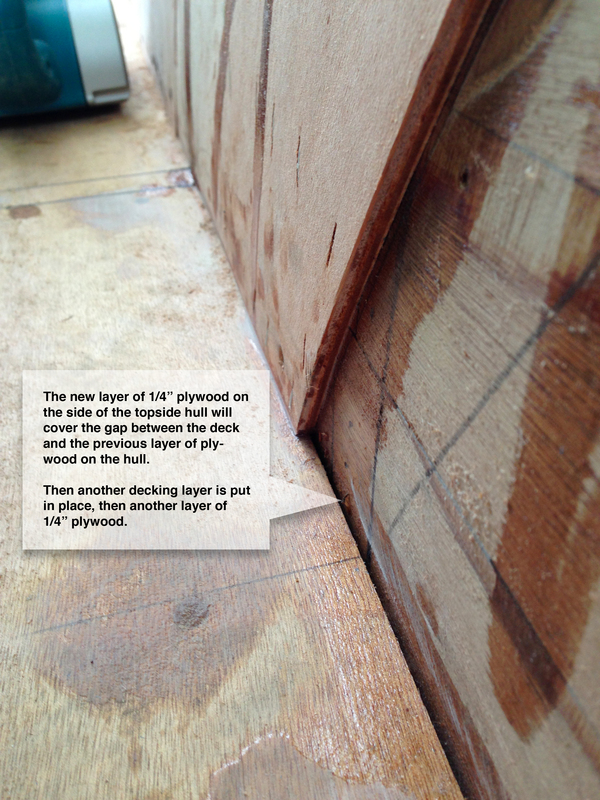 So… this week I am putting the next layer of topside 1/4″ plywood on and (I knew this would happen) tada! The gap is closed. Very nice. This is also the plan for adding to the deck strength. The deck will have multiple sub-layers before a fancy and beautiful top layer is installed. The sub-layers will be installed in steps: one deck layer, one hull layer, one deck layer, one hull layer. In the end, the boat will have a very strong joint made by bonding and trapping deck and hull layers together. ← Now in Wired. How Crazy!